Tampa Bay Buccaneers running back Doug Martin has not been assured that he will be the team&apos;s starting running back when he returns from a drug suspension, general manager Jason Licht told ESPN. Martin has three games remaining in his suspension and will return in Week 4 against the New York Giants. "Look, he has done everything we&apos;ve asked him to do, and he looks reminiscent of 2015 when he was playing for his contract," Licht said. No one on the New York Giants&apos; defense has spent more time working with coordinator Steve Spagnuolo than weakside linebacker and captain Jonathan Casillas. The two worked together in New Orleans in 2012 when Spags was the Saints&apos; coordinator, and they were reunited here two years ago when the detail-obsessed Spagnuolo was hired for a second tenure with the Giants by Tom Coughlin and retained when Ben McAdoo was elevated to head coach last season. Talking football is a constant for the two, and Casillas believes Spagnuolo is mellowing. Marshall doesn’t mind being in shadow of Odell Beckham Jr. 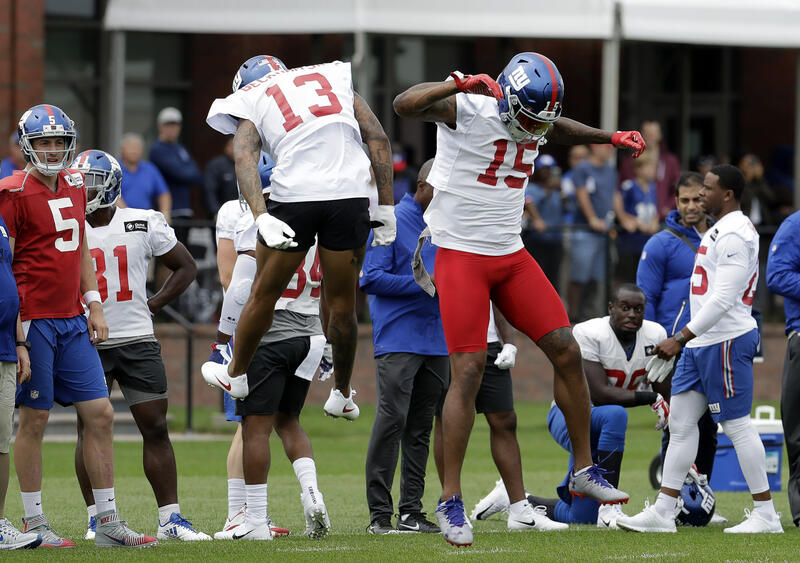 Comments Off on Marshall doesn’t mind being in shadow of Odell Beckham Jr.
Odell Beckham Jr. put on a show on the second day of training camp for the New York Giants, and no one may have enjoyed it more than fellow receiver Brandon Marshall. Signed by the Giants as a free agent in the offseason, the 33-year-old Marshall gives quarterback Eli Manning another option on the outside of the offense other than Beckham. The Giants used Victor Cruz there last season, but he just didn&apos;t have the speed and size to play on the outside and was released after the season. Giants receiver Odell Beckham says his ambition to be the highest-paid player in the NFL isn’t only about himself. Beckham said he’d like to see the top NFL stars make comparable salaries to the top stars in the NBA, where Stephen Curry recently signed a deal that guarantees him $40 million a year. “You want to change the game,” Beckham said. Entering his 14th season, the 36-year-old New York Giants quarterback just smiled Friday when asked about the number and comments by general manager Jerry Reese that the two-time Super Bowl MVP will be on somewhat of a pitch count in training camp. The goal seemingly is to limit the wear and tear on the &apos;&apos;old guy&apos;s&apos;&apos; arm heading into a season when the Giants have high hopes following their first playoff berth since winning the Lombardi Trophy in February 2012. &apos;&apos;I know how old I am,&apos;&apos; Manning said after the Giants held their first training camp workout. The New York Giants reported for training camp less than two days ago, and star wide receiver Odell Beckham Jr. has already caused a stir around the league. In a video posted by Uninterrupted, Beckham outlined one of his main career goals, and it didn&apos;t have anything to do with bringing the Lombardi Trophy back to MetLife Stadium. Instead, the 24-year-old LSU product stated his desire to be the NFL&apos;s highest-paid player. New York Giants star Odell Beckham Jr. wants to be the NFL’s highest-paid player at any position when his current contract expires at the end of the next season. “I believe that I will be hopefully not just the highest-paid receiver in the league, but the highest-paid, period,” Beckham said in a video interview with Uninterrupted on Thursday.